You’ve seen the ads before, right? Ads that promise unparalleled health benefits from a newly discovered “superfood” that only grows in the most remote place of the world. And now for the first time ever… you can use the extract of this superfood that has helped a society of hermit monks to live hundreds of years without any signs of cancer, diabetes, or heart disease. …most superfoods are not all that special or unattainable. Most are right in front of your face and you don’t even know it. And the thyroid superfood I’m about to share with you is one of them. It’s something I learned from Dr. Raymond Peat and have been using with my clients ever since. This thyroid superfood works to improve your thyroid health by killing the Thyroid-Adrenal Stress Cycle that’s ruining your thyroid health. …why do so many people go out of their way to avoid this superfood? I’ll tell you exactly what this superfood is in just a second. 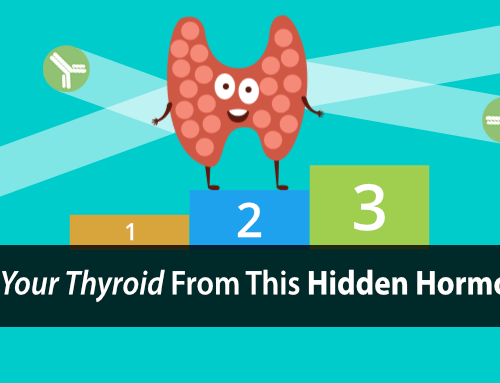 First, let’s take a look at why it’s so good for your thyroid. One of the biggest problems driving your hypothyroidism is what we call the Thyroid-Adrenal Stress Cycle. It’s a vicious cycle where the more hypothyroid you become, the more you become dependent on stress hormones, while these same stress hormones further suppress your thyroid. This has everything to do with your ability to regulate your blood sugar (or lack thereof). When you become hypothyroid you lose the ability to regulate your blood sugar. Your liver requires thyroid hormone (T3) to store sugar in the form of glycogen which acts like a blood sugar fuel tank. …you depend on your fuel tank (your liver) to release that stored sugar to prevent your blood sugar from dropping too low. But for hypothyroidism sufferers, there’s simply no fuel in your tank to stop this, thereby allowing your blood sugar to drop too low. …and ultimate traps you in that endless hypothyroid state. 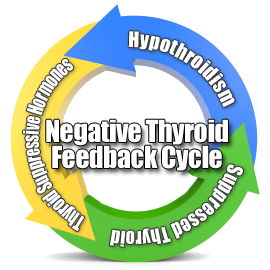 This chronic cycling of stress hormones is also responsible for blocking your liver from converting inactive thyroid hormone (T4) into activate thyroid (T3). (Note: And it’s this chronic cycling of stress hormones that can also lead to diabetes as discussed in detail in this article “Hypothyroidism and Diabetes: How to Reverse It and Why Sugar Is NOT the Problem”). So, what do you do when your fuel tank is empty and you can’t store fuel, and you can’t convert thyroid hormone? The good news is that this thyroid superfood helps break this Thyroid-Adrenal Stress Cycle by helping your liver to store more sugar and preventing this continuous struggle with falling blood sugar. In other words, we use it to help do the job your liver is supposed to be doing while your thyroid and liver heal. And by breaking this Thyroid-Adrenal Stress Cycle it also helps to lower stress hormones which unblocks your conversion of thyroid hormone and boosts your T3. 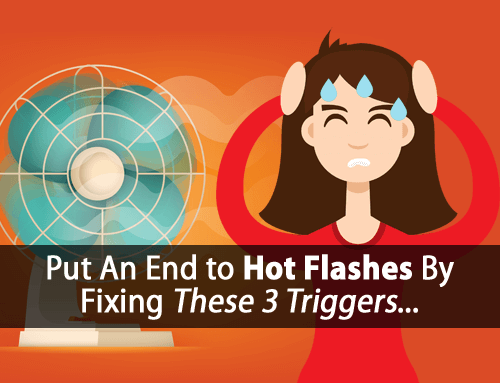 However, many thyroid sufferers today are turning to illogical and dangerous methods for regulating blood sugar which only drives your Thyroid-Adrenal Stress Cycle even harder. Many practitioners and “experts” are recommending the use of more protein to regulate your blood sugar, and oftentimes a high-protein low-carb type diet. Sorry to be the bearer of bad news but… this simply doesn’t work. Protein doesn’t help your liver store fuel. And promotes insulin resistance which blocks your cells from using sugar. 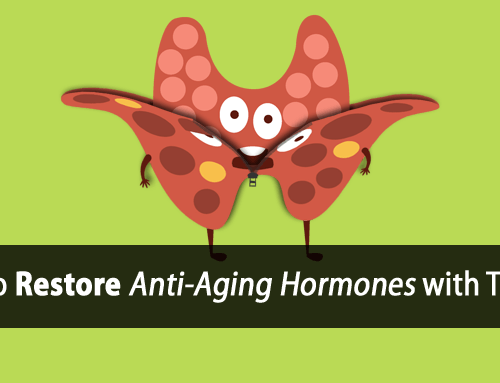 Yes, these stress hormones will convert protein into sugar to bring your blood sugar back up. But they also suppress your thyroid by preventing your liver from converting T4 into T3. And, by making you more insulin resistant, they block your cells ability to use blood sugar. So, while you might think this is solving the problem, it’s actually making it worse. And that’s what makes this thyroid superfood so effective. How This Superfood Protects Against Diabetes, Cancer, Heart Disease, and More. This thyroid superfood also has a number of other health benefits that extend far beyond protecting against stress and boosting T3. It contains a special molecule called Naringenin, which is currently being studied for its protective effects against inflammation and various types of diseases. [See Study Here], lung cancer, and prostate cancer [See Study Here]. Studies have also shown it to be protective against heart disease by increasing blood flow, preventing clotting, protecting against oxidative damage, and reduces blood pressure [See Study Here]. It’s been shown to improved cognitive function and protect against Alzheimer’s disease [See Study Here]. It’s been shown to protect against diabetes by significantly lowering fasting blood sugar and restoring insulin levels [See Study Here], as well as preventing the inflammatory effects of high blood sugar [See Study Here]. What Is This Thyroid Superfood? As I mentioned, this superfood is widely available (although under-utilized today). Yet, it doesn’t come close to getting the attention it deserves. And its protective effects with diabetes are interesting because most diabetics are scared to even touch it (even though it has been shown to be an ideal food for diabetics). This thyroid superfood is none other than… orange juice. Pulp-free and not from concentrate is best because the pulp cellulose can contribute to bacterial issues in the gut. It’s something I use effectively with all of my clients. Find orange juice too acidic? Just add a pinch of baking soda to neutralize the acidity. While fresh squeezed oranges aren’t very acidic, store bought juices oftentimes use unripe oranges that are more acidic. And over the years, I’ve had maybe three clients who couldn’t use orange juice, in which case we use the next best option, cherry juice. Try sipping on small amounts of orange juice slowly throughout the day. And for an even greater therapeutic effect, add a little salt. Using orange juice properly can have a huge impact on your thyroid health. But combining it with other thyroid-boosting foods can have an exponential effect. 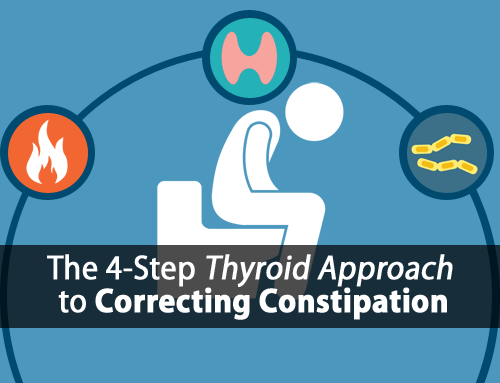 And that’s something I show you how to do in our 3 Food Triple-Thyroid-Boosting Daily Protocol. If you’re not using this daily protocol then download it right now and get started today. See for yourself the difference it can make while feeling calm, clear, and full of energy. 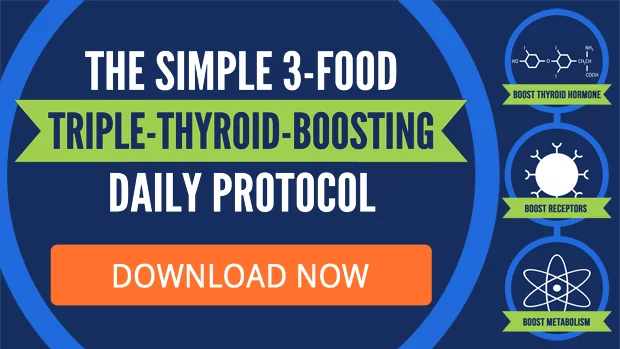 Click here to download the 3 Food Triple-Thyroid-Boosting Daily Protocol for free right now. I am really feeling the benefits of superfood orange juice! And a little bit before bed helps me fall asleep instead of lying awake for ages. Tastes great too – added bonus!! Hi Louise, it’s working like it should so that’s great to hear. I started with your weekly diet plan and I have already lost a kg so my question is HOW MUCH ORANGE JUICE AM I ALLOWED TO DRINK IN A DAY? Thanks for all the great articles Tom. i have such a hard time believing this could work but i will give it a try. Hi Heather, there are a lot of people who have and couldn’t be happier. See some of the comments left here. Love it Tom! (Except the part where you say “your” hypothyroidism – I don’t want it and it’s definitely not mine!?). Tim’s latest labs just came in and His TSH is down to 2.1 (it was up to 18+ When this ordeal started!, So thank the good Lord and you – He’s been doing your plan, along with some juicing for detox, and a few rounds of Whole 30, with the exception of raw milk and organic, pulp free OJ, for the past year and a half, a gradual build) and he’s back to his energetic, athletic, vibrant self and we are so grateful to you for sharing the plan and showing the way! He enjoys the OJ best of all!? I’ve had a full thyroidectomy and I’m currently taking desiccated thyroid each day. 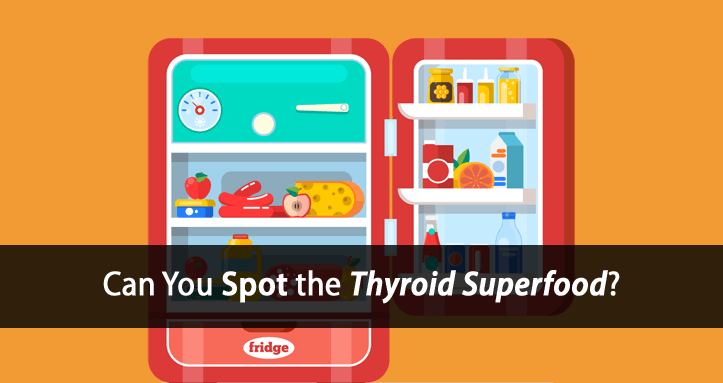 Can I benefit from these super foods without having a natural thyroid? Can they improve the function of my medication? So much of the research that I’ve seen on thyroid applies to those who have one that is dysfunctional and either hyper or hypo. There seems to be little to suggest what could work for those of us without one altogether. Hi Robyn, the short answer is yes, everything we teach still applies 100%. The only difference is that you will need to supplement thyroid hormone to the degree that you cannot produce it. However, it’s important to understand that just because you take thyroid hormone doesn’t mean that the hormone is getting to your cells. Thyroid hormone can get blocked many places along this pathway. For example, most hypothyroid people can’t convert inactive T4 thyroid hormone to active T3 thyroid hormone that your cells need. Thyroid hormone can also get blocked in the bloodstream, at the cell receptor, etc. You can supplement all of the thyroid hormone you want but if you can’t get the hormone to your cells then you will still be hypothyroid. I notice that a lot of the foods you recommend use dairy. I have dairy allergies and am wondering if I would get the same benefits by using goat milk kefir instead of cow’s milk. Any feedback you have on that is most appreciated! HOW ABOUT TANGERINES, MANDARINS, CLEMENTINES? I USE A LOT – JUST SUCKING JUICE. 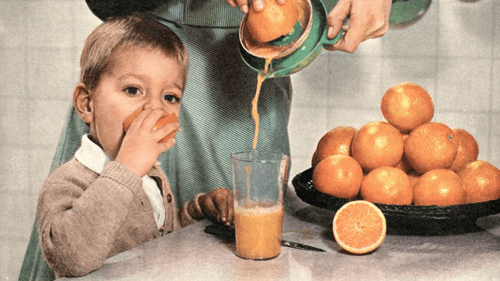 How much orange juice should you drink a day? Thanks for the tip about adding a pinch of baking soda. I love orange juice, but I do have an acidic reaction after drinking it. Will try it again! I was using this as you directed till I read how manufacturers use a deaeration or heating process to remove the oxygen as the juice is stored in large vats for up to a year, then `flavor packets` are added containing a chemical called ethyl butyrate to make it taste like oj again .. not exactly a healthy choice unless you are making fresh squeezed juice ! I never thought I would like the salt in the OJ. I used very little salt in my cooking, just some. I actually have found that now I’m spoiled to how great it tastes and I don’t want my OJ withOUT the salt! It’s delicious!! This whole thing has changed my life. It’s slow and I’m not where I want to be yet, but it’s a huge improvement over where I was before I started following your instructions. Thank you. Thank you for doing the research, being a writer who I can understand, being specific and thorough in your instructions, and making it available to me for a price I can afford. Hi Catherine, I’m happy to hear that! I have stomach pain when drinking fresh homemade orange juice. Hi Jula, as mentioned try adding a pinch of baking soda and that can help. The flavonoid naringenin discussed here as well has been shown to help with heal ulcers as well. Will the sugar in the orange juice have any effect on prediabetics ? Hi Usha, as mentioned in the article, it’s been shown to be beneficial and protective for diabetics which would include prediabetics as well. Can just eating an orange do the same thing or do you have to squeeze the juice? Hi Amber, thyroid sufferers have issues with bacterial overgrowth which can feed on the fiber. So, we use the juice. I was very interested to read about yoghurt and kefir being a burden on the liver. Having had GERT for years along with Hashimotos, I have been encouraged by professionals to go low moderated starch, grain free, diary free, caffeine free to stop irritating my gut and to heal it with fermented products like sauerkraut, kefir etc etc. I find tho that these fermented products irritate me more than help. I was raised on plenty of milk and love it and have been off it for years supposedly for better health. Now I am osteopenic so am back on the milk again. I have been having milk kefir tho will stop that now after reading the above. When I buy cottage cheese, all I can find is the 97% fat free type. Is that ok or should I be looking for the full fat version? I never could drink orange juice without it burning, however, the addition of the Bicarb and salt has changed that, thank you. What about all the sugar content of orange juice? One cup could have 21 grams. And the fructose? Isn’t that less ideal to manage blood sugar levels? I am having a hard time believing this information. Hi Yaz, quite the contrary. Fructose (not high-fructose corn syrup) can be metabolized without insulin and has been shown to improve glucose utilization in type 2 diabetics. It’s ideal for regulating blood sugar. Hi, what kind of salt should we be using? I have been using pink Himalayan salt and stopped using regular table salt. But now I don’t know if this is good. Thank you so much for your research on this autoimmune sickness . It is def needed. Hi Holly, What I recommend is the canning and pickling salt because it’s pure salt without any additives, iodine, or harmful ingredients. I don’t recommend pink Himalayan salt because it contains metals that are toxic and other components that can irritate the digestive tract. What happens if you are allergic to orange juice? Is there another type of juice that would work just as well? My mother is allergic to oranges and orange juice but not lemons, limes or grapefruit strangely enough. Hi Jacki, the next best option would be cherry juice. I cannot stomach coffee….believe me, I have tried. Just don’t like it! Can I drink hot chocolate or chocolate milk for the same result? I eat carrots, orange juice and avoid cruciferous vegetables, and have noticed some difference in my health. I still have to take Armour, stil have heart murmurs( or palpatations, I guess) but am starting to feel quite a bit better….thanks, Tom. Hi CJ, unfortunately those won’t act as a direct replacement. I have food allergies, all dairy, egg, pineapple, green beans, tuna. What can i do instead. I have been told to eat lots of protein, good fats and veggies. I have Hashi’s and low adrenal function and have blood sugar issues. I was able to get my blood sugar down to 98 but with limited fruit. Your diet makes sense to me but when I tried it, my blood sugar went up to 128 in3 weeks so I got scared and stopped. I’ve been dealing with these issues for YEARS and so want to get better. Any suggestions? If I start up again, will it eventually even out? Hate the high blood sugar! I have been following Tom’s program for about 8 or 9 months now and it has been life changing for me. I can live again.Thank you Tom for all your knowledge that she have shared. Tom my LDL has increased what do you suggested food wise that will help me too lower. Hi Sandy, based on research studies ideal cholesterol is 220, with an ideal range being 200 to 240. So, oftentimes trying to lower it will only further inhibit thyroid function. Tom, I discovered you and your work a couple of weeks ago and purchased the Hypothyroid Revolution and am on the program. Not ‘fully’ on the program yet but getting there. I have been doing the Triple-Thyroid-Boosting Daily Protocol now for coming up on 1 1/2 weeks and my life has changed for the better. Thank you SO much. I love your articles and I love the comments. I am learning SO much and feel like ……………. finally at 53 that I understand my body and its needs (I suspect I have been hypothyroid most of my life) and can finally take control. I have lost 6 pounds and it just falls off. I have more energy, I am calmer (most likely because I was running on adrenaline for SO long) and I finally have hope for the future. Thank you for what you do and keep doing it. Namaste. Hi JenE, that’s great to here and thank you for helping to show others what is possible. Looking forward to hearing about your continued success with the HR Program. I take a small amount of orange juice with a little salt added to bed each night at it really helps. I sometimes wake up for no reason wide awake like my energy just kicked in. I take very small sips of the OJ and I am able to go back to sleep. I am using Simply Orange juice that is the best I can find around the stores where I live. I have been taking Niacin to help lower my LDL a little bit is that ok for my thyroid? Also sometimes I think the Niacin makes me itchy! Thanks for all you do! I signed up the 7-day meal plan at the beginning of the week. So far, I am feeling pretty good on the protocol, but I have noticed some edema from all the salt (?). The obvious answer would be to reduce the amount of salt I’m consuming, but I wanted to get your advice on the matter before I did that. Hi Valerie, hypothyroidism sufferers waste sodium very quickly. So, it’s important to get adequate sodium through your diet. If salt intake increases quickly, it can cause a little edema initially. But only over the short term as the body will regulate sodium levels within a week or two. Hope this helps and happy to hear that you’re feeling better. Hi Angela, fresh squeezed orange juice is always best. But it’s important to remove as much of the pulp/fiber as possible. Is there a brand you suggest?! Or ones to avoid? Hi Tom. I have been on your program for over a year now. I want to address those who cannot believe the info you are giving us. I too was there, eating all the other “hypothyroid experts” told us to eat. Tom is so right about it hurting your liver. I became so hypoglycemic (low blood sugar) that I personally contacted all of those I was following. Each told me I was getting too much sugar and believe me, I wasn’t consuming any type of sugar or fruit. I was so bad I was passing out and brain fog I couldn’t deal with. I was up eating “fats” 2-3 times a night trying to survive. So being at rock bottom made me look past what I couldn’t believe Tom was saying and I went full on with his program. I had to learn to digest dairy and coffee. But it all worked! I can think. I am at ideal weight. I can sleep all night. My stomach doesn’t hurt. I feel good. Please know Tom will help you. Thank you Tom.